“Yes” may be the word that all salespeople want to hear, but Andrea Waltz knows that to a salesperson, the word “no” is just as important, maybe even more so. She is one half of the two-person team behind the best-selling sales book Go for No!, which encourages salespeople to push for a “no” rather than avoiding it. Waltz got her start at LensCrafters and now runs her business Courage Crafters with her partner, husband, and co-author Richard Fenton — has spent years training sales departments at some of the U.S.’s largest companies to chase a “no” in order to get more prospects saying “yes”. 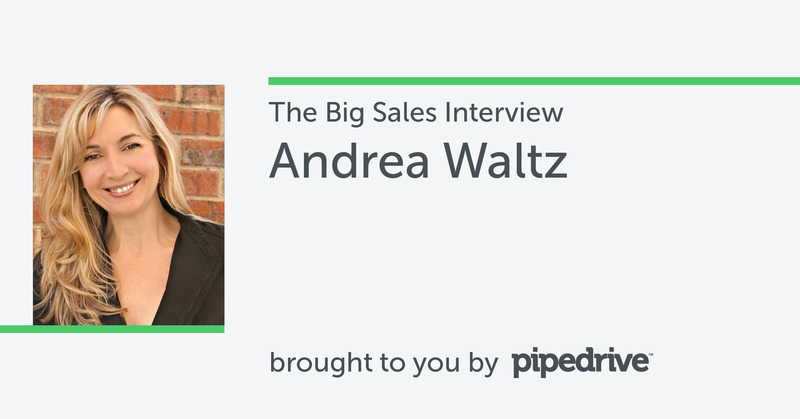 Waltz is the first of Pipedrive’s Big Sales Interviews, a series of in-depth discussions with thought leaders in the sales industry. The Big Sales Interview goes beyond each thought leader’s sales philosophy, and even beyond sales. We ask each expert about their history in the sales industry, the mistakes they’ve made, their greatest triumphs and even favorite sales reads. My name’s Andrea Waltz. I’m probably best known as the co-author of Go for No!, a little book that we wrote back in 2000. It was finally in 2010 that it hit number one on the Amazon “Sales and Selling” list and it has pretty much been in the top 20 ever since. It really is all about not fearing “no,” understanding that going for “no” helps you get to “yes” more frequently. Quite frankly, if you are disqualifying prospects and being okay with “no,” it makes your sales all that more effective. All of my sales jobs have been in retail sales, with the exception of my own business, which is our two-person operation, Courage Crafters — the company we founded in 2006 specifically to teach this Go for No philosophy. My very first job was a retail sales clerk at a gift shop, and then from there, a wide variety of jobs. My biggest sales job was at LensCrafters, running one of their highest-volume stores. That’s really where I learned how to sell. You went to school for criminal justice. How did you end up in sales? Like so many people, I was going through college and working at the same time. I wanted to be a crime scene investigator, but at the time there were no jobs for that. I was working at LensCrafters, and right when I graduated, they promoted me to Retail Manager and then promoted me quickly thereafter. While at LensCrafters, I met my now-husband and business partner. We had a lot of the same sales, customer service, and management philosophies. I had no idea what I was doing, but I did have my philosophies down. I knew the sales philosophies that I had learned, practiced and taught. I had customer service philosophies and management philosophies. We quit our jobs and launched our company. One of the very first clients we ended up getting was J.C. Penney. We did a tremendous amount of work with them, teaching them all of the sales philosophies, including Go for No. That really launched our business. We worked in the retail industry for about five or six years. Then with the success of Go for No!, we started getting into different industries — direct sales, insurance, finance, anybody who has to face failure and rejection. “Salesperson” is a laden term. When did you first own that label, and what makes you proud to sell professionally? It’s really incumbent upon sales people to get that mindset. I was lucky to get it early on. I didn’t see sales as something I was doing to people, but something I was doing for them. I would see timid salespeople, people that were selling from their own wallets. A customer would come in, and maybe the salesperson wouldn’t sell them the best product for them. Later, the customer would end up having problems. They would come back, needing to upgrade to something more appropriate for their needs. I got a really good lesson in seeing how, if you weren’t proactively selling people the absolute best thing for their needs, regardless of how expensive it seemed at the time, that could backfire. It’s funny because nobody likes that title. I was at a sales and marketing trade show, and when I asked one of the people that had a booth there what they offered, he told me and then said, “But I’m not a salesperson”, as if it was a bad thing. Even at that moment, I thought that was pretty sad. How did you develop your core sales philosophy of “Go for No”, your “difference maker”? Was there an “aha” moment? Richard was in the retail industry for many years, learned the whole idea of going for no, applied it to his job and eventually became an award-winning salesperson. When he taught it to me, I thought I was a superstar salesperson. I thought I had a great rapport with people. I wasn’t afraid of recommending the best products and services we had; I thought I was pretty great. Then I realized, when I learned what Go for No was, that I had a fear of hearing the word “no,” even though it wasn’t obvious to me. I discovered that oftentimes I would sell, and if I got that one “yes,” I would be done. I would end the sale, close it down, and send the person on their way. I didn’t want to look pushy or aggressive and was operating from a people-pleaser mindset. As we’ve taught it throughout the years, watching people have their own epiphanies has been a great motivator for me personally. I think a lot of people feel the same as I did and then they have the same transformation, which is really cool. In your book, you talk about the importance of getting “no's” from prospects. Why is it so important to actively attempt failure? My favorite point to the whole philosophy is that successful people understand and salespeople know that they want to get a “yes,” but you have to face the possibility that you’re going to hear a “no,” and then you go for it. That is fundamentally what Go for No! is all about. It certainly isn’t about ever being a “failure,” but many of us equate hearing a “no” to failing. We have all been taught and trained — especially salespeople — to “Go for yes. The “go for yes” philosophy actually creates that aggressive, pushy, what-will-it-take-for-me-to-get-you-in-this-car type of salesperson. The Go for No philosophy is the exact opposite. “No” is a perfectly acceptable answer, but the point is, I’m going to have the courage, persistence, and tenacity to ask all the appropriate questions and possibly face that "no." That is where the idea of failure has to be turned around in people’s minds. That’s what creates a lot of stress for salespeople. That’s why we talk about failure and success in relationships. Can you talk about the first time you actively went for a “no” yourself, knowing that’s what you were doing? We’re a small company, just myself, my husband Richard and our cat. What’s the one thing you would have done differently when you started out in sales? How would you approach it now? I think one of the things I wish I learned early on was to be a really good fact-finder and asker-of-questions. I learned that later. I wasn’t like that when we first launched our business, which, is of course, B2B sales. I’m out there selling workshops and in-house training to large corporations. I wasn’t able to get on the phone, probe for needs, and find their gaps. It was me pitching [products as a salesperson] and thinking of things transactionally. Drawing that analogy to sales, what was the worst beat you had? One of the things that we like to say is that a good “no” is better than a bad “yes.” All salespeople know that deep inside somewhere, even though they don’t want to believe it sometimes. But this one time, I ignored that rule and said “yes” to a client that we had pursued and finally did business with. I knew it wasn’t a good fit. In other words, we got a bad “yes” in the deal. They pretty much wanted us to train all of their material, not train our material. We had no desire to do that. We went down a horrible path, and in the end, it cost us a lot of time and expense. It was painful, it was stressful — all because we didn’t listen to our intuition and missed that it was a bad “yes” from the beginning. What’s your greatest sales accomplishment to date? I guess it was probably getting our first big client in our business. I say we got lucky, yet the smartest thing we did from a sales standpoint was to identify our target market. We knew who should hire us. We knew who we should be working with and who we should be working for and — as bad as our marketing materials and sales presentation was — we still had the guts to go out and try to get those clients, and we did. From that standpoint, being willing to define our niche and target our market, I think was probably the smartest thing we did. To me, the biggest success was not being fearful. In sales, you have to have confidence and be detached from the outcome. You have to focus on your sales activities and your sales behaviors. It’s almost like when you’re digging a hole and you want to dig and dig, but every minute you’re concerned about how much dirt you’ve gotten out of the hole. You keep weighing it and measuring it and looking at the pile you’ve created outside of the hole. That is really counterproductive. I find so much less stress and less pressure in my own business because I practice the Go for No philosophy. I do the sales behaviors, but I don’t get overly attached to the possible result. It has created a really enjoyable business for me, which is basically my life, because quite frankly, as a sole proprietor entrepreneur I work 24/7. There probably are three days I take off for the whole year. Christmas, maybe New Year’s Day and Thanksgiving, and that’s it, because I do love it so much. That mindset has really impacted me as a person. I love the idea of having ways that salespeople can track their progress. As salespeople, we’re great at schmoozing and having conversations and even asking questions and figuring things out. But the second part — the negotiation, the follow-through, when prospects start dragging their feet, the follow-up to “nos”? That second half of the process is still wildly lost for [many] salespeople and organizations. We all do really well at the beginning of the sales process, but in that second half of the sales process, there’s still a huge opportunity for the sales industry. That’s the job of a salesperson and I think it’s still getting lost. For example, I’m a big advocate of social selling, but I think social selling is just one more tool that helps us start the first half of the sales process. Then the question is, how are we doing on the second half? Are we following through and getting those sales closed? What’s the most misguided philosophy or practice in sales today? I’ll go back to social selling again. I think there’s a lot of misconception about what that process is. You’re a big fan of social media and are very active on Twitter as @goforno. Do you have a vision of what social selling looks like when it’s done right? Absolutely, I do. I break it down into three pieces. Three is influencing the influencers. Any salesperson has got to be out on these platforms, and they’ve got to be listening, paying attention and engaging. I’m still shocked at how bad people are at engagement and how poor a job people do. Whether it’s Facebook or Twitter, a 'Like' is not engagement. That engagement is how you make your social media community and platform pay off. Then, when it comes to influencers, who are the influencers in your space? Who are the people that you would like to influence — in other words, your customers or your prospects? Follow them, listen to them and engage with them. Don’t just like the stuff they say every now and then. What book do you think everyone in sales should read? All our philosophies come back to this whole idea of mindset. For salespeople, I always recommend books on success that motivate and inspire you. I oftentimes have salespeople who get the whole idea of Go for No intellectually, but they still have issues around the practical aspects, as well as fear and anxiety. One of the best books for that is The Four Agreements, by Don Miguel Ruiz. “Don’t take things personally,” because as salespeople, we do tend to read into why somebody hasn’t called us back. And, “Don’t make assumptions,” or, in other words, don’t decide what somebody else is going to decide, do or spend. I think The Four Agreements is great for any salesperson. It’s more on the mindset side of things, but can have a major impact because — if something’s holding you back — oftentimes it's not about skill as much as mindset. How do you define “salesperson”? A salesperson, to me, is a consultant with the customer’s best interest in mind. Thank you very much for your time, Andrea.